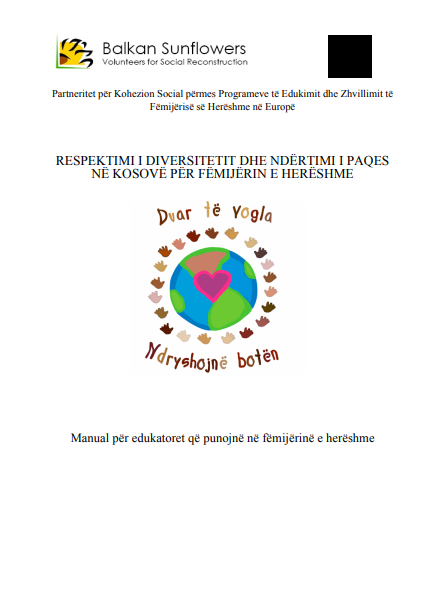 The Respect for Diversity and Peace Building Manual is an adaptation of the Regional PRECEDE Manual implemented in 48 kindergartens in the 5 Balkan countries; Albania, Kosovo, Serbia, Croatia and Macedonia. It also represents combination of the International Handbook of Professional Workers with Young Children in Conflict Areas developed by the International Peace Network and the Manual on Social and Financial Education of Young Children developed by the Aflatoun Secretariat. In Kosovo, its main purpose is to help educators and professionals working in early childhood centers and institutions.